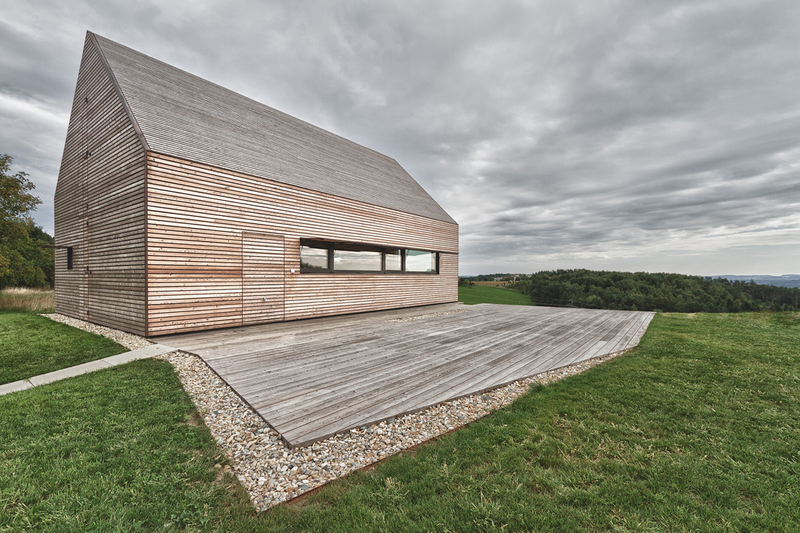 Project Information Summer House In Southern Burgenland. 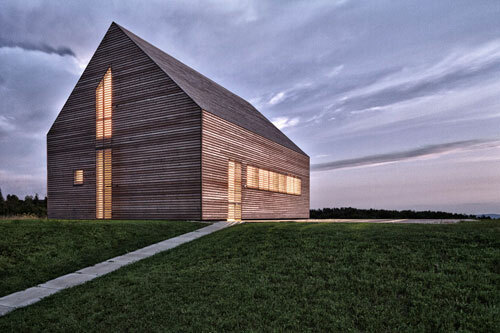 The project Summer House in Southern Burgenland (Austria) describes a sharp-edged cubature which fits into its surroundings through its simplicity and homogeneous appearance. 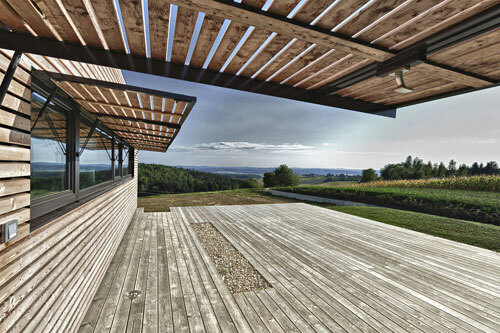 In being used as a summer house, and by virtue of the installation of a wine cellar with production surfaces at a later date, the building’s design is oriented by the cubature of the Kellerstöckel(wine house) typical of the Southern Burgenland region. The cellar contains rooms for wine storage and production; the aboveground rooms are for residential use. The cellar has been executed in a ferro-concrete massive construction. The ground floor and first floor were constructed as a pure wood construction. Here, the undisguised wooden cross layer elements were rendered effective not only in their structural-static functions but also as design elements. 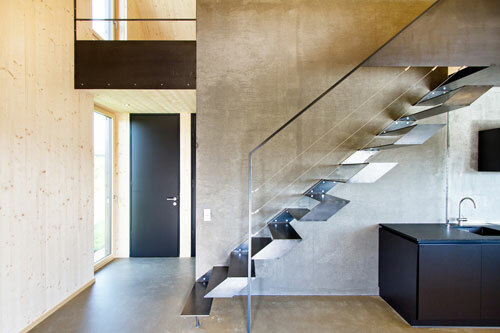 As a counter weight, the wooden construction material employed on a large-scale stands vis-à-vis exposed concrete and steel materials. The materials were consciously employed in an untreated, undisguised state; in their combination, they form a homogeneous ambiance. 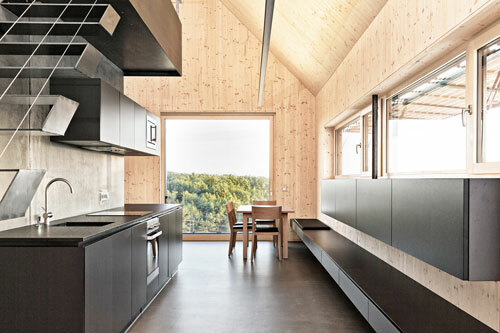 As the summer house is not inhabited during the winter months, a larch grid mantle was developed which can be shut completely. 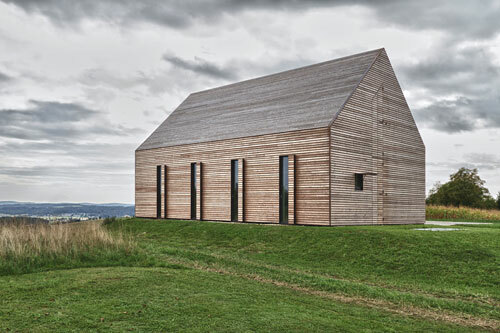 During the uninhabited winter months, the house is thus unobtrusively and sculpturally situated in the landscape.